How many pieces of cake can be packed in this box? 10 pieces, yes in the past we usually have such 10 pieces a box cake. Like my godmother’s family, there are 8 children and including godmother and godfather there will be 10 of them. So a box of cake will be just enough! 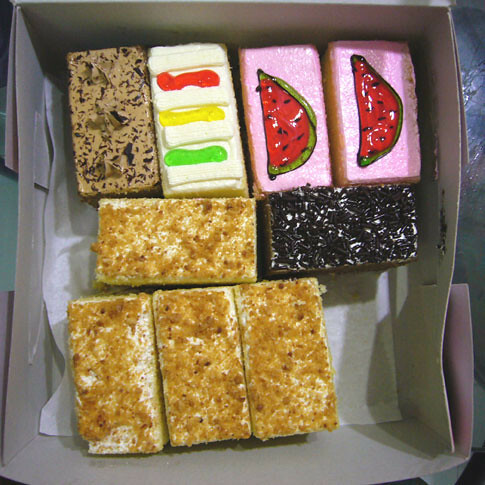 This is the good old tasty type of butter cakes that I like best. Frankly I don’t like those cheese cakes or blueberry cheese cakes and fresh cream cakes nowadays. I still prefer the old butter cakes but some confectionary shops just don’t make them well. This one at Beach Road, said to be an very old shop, their butter cakes are to my liking (I’ve no relation or dealings with them, I’m just a customer). Simple design, simple taste that brings back good old memories. Of course it was very much cheaper in the 70s, now it’s 80 cents a piece. 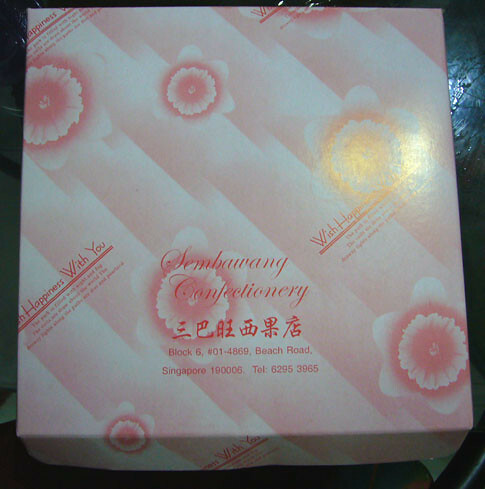 My godfather used to buy at least 2 boxes of cakes home in the past so that some of us can have more than 1 piece. One thing I missed very much is the Rum cake. Anyone know where I can still find them? 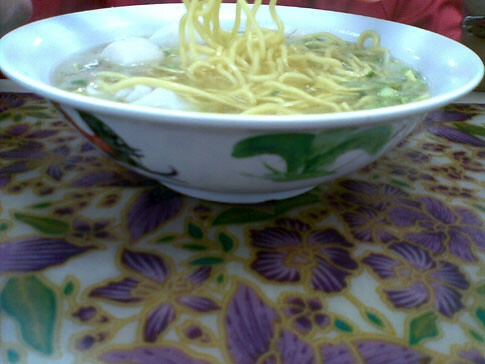 Of course this bowl of fish ball noodle costs more than 10 cents now in a food court. I remembered when I was a primary school boy in Beatty Primary School, around 70s, I paid only 10 cents for 1 bowl of fish ball noodle. Though the quantity was not much, but it tasted so wonderful! Was it really so tasty? Or because the joy of having making your own decision to buy whatever food you like without your parents interference in the school tuckshop (we used to call the canteen – tuckshop then)? I guess so too…. The other thing about eating noodle soup in the school tuckshop was after finishing it, we could just walked right into the stall to refill the soup as many times as we like. I would tried to scoop right to the bottom hoping to find some leftover fishcake or meat in the soup. After refilling the soup, I would add in more chilli to add taste to the soup. 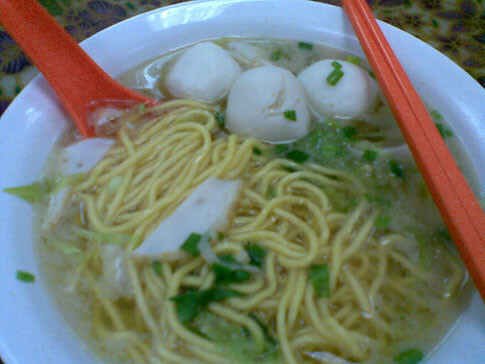 Now a bowl of fish ball noodle in my girl’s primary school canteen costs her 60 cents. Of course the kids now will not bother about such free refilling of soup any more. 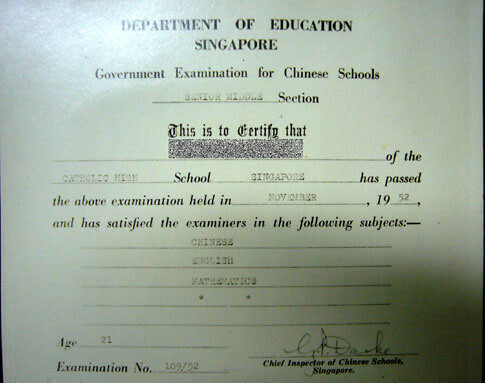 My father told me that in the past before the introduction of photocopier or xerox machine in Singapore, most students would bring their school certificates to the photo studio to have them photographed. The minimum print then was probably 12 pieces. Even if photocopy or xerox was available later, it was still very expensive. 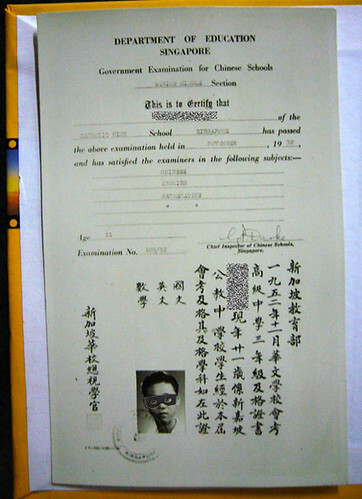 My father would used this photographed copy to apply for jobs, similar to us now using photocopied type. It’s about the size of 3R photo but slightly longer and narrower, so it may have problem fitting into a normal pocket album. As you can see from the photograph, my father had his Senior Middle education in Catholic High School then. Many people asked my father what is Senior Middle? 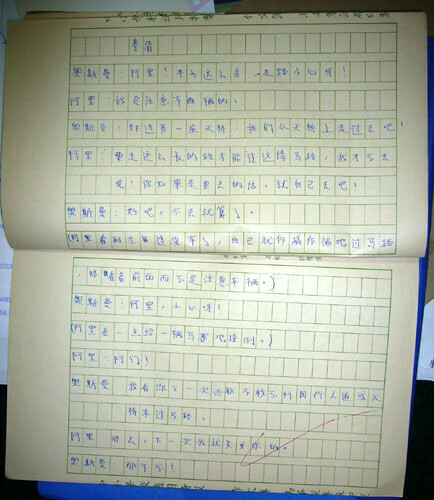 My father told me that during his time, the education system was 3-3 compared to my time 4-2. OK, so my time was 4 years of Secondary education and 2 years of Pre-U (later then it’s Junior College). 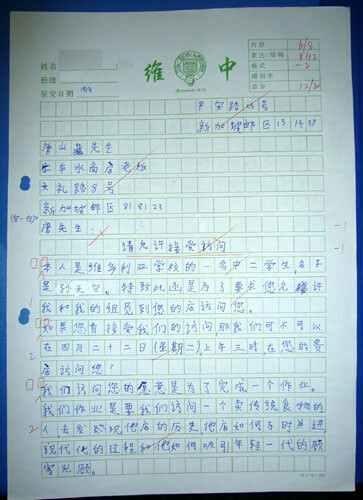 My father’s time was 3 years of Secondary education and 3 years of Pre-U education. So his graduation from Senior Middle 3 means he had completed his Pre-U 2 education and could continue to further his studies in the university. He didn’t go to the U then because at that time, my grandfather and my uncles could not afford it. One thing to note is why was he 21 years old when he graduated from Senior Middle 3 in 1952 then? Most of us would be 18 years old if we will to complete Pre-U 2 but why was he about 3 years older? 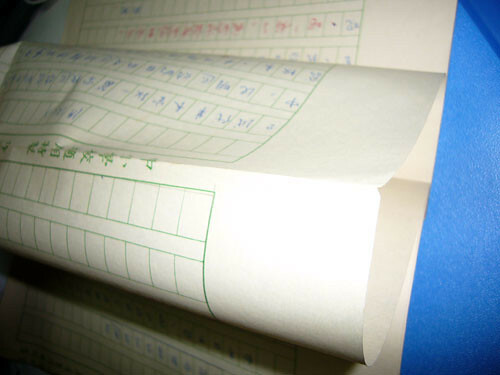 Clue – he did not repeat his education. My father was educated in Chinese then but in Catholic he was also taught English. 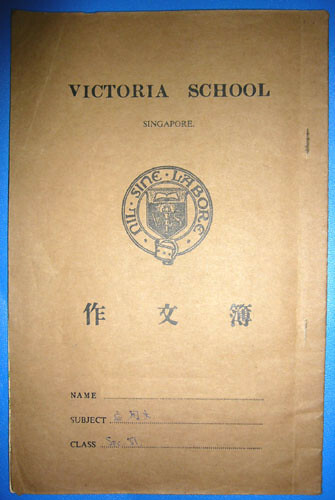 Most Chinese-speaking parents then usually wanted their children to be educated in Chinese for their cultural identity.Catholic High School was founded in 1935 by Rev. Fr. Edward Becheras, a French missionary. Although it is a Catholic school, it also accepts non-Catholic students like my father. Thanks to Rev. Fr. Edward Becheras, my father was educated in both Chinese and English. Becheras envisioned the school of bilingual learning. So have you got the answer why was he 21years old when he completed his Senior Middle 3 in 1951? This should remind you of the old Public Utilities Board bill! And if I’m not wrong, it’s around the 80s period. 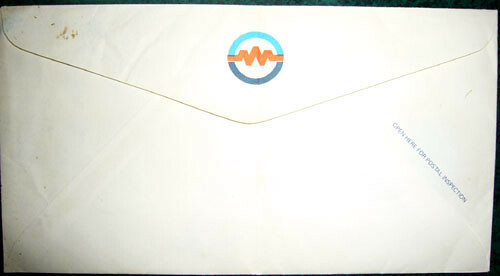 This can be seen in the Save Water Campaign on the front of the envelope. 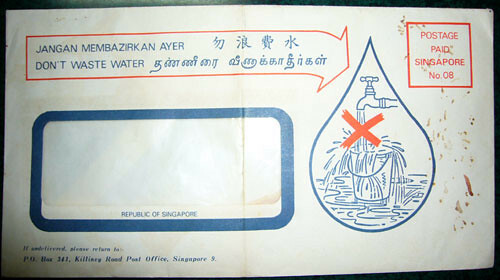 The Save Water Campaign was by PUB in 1985. You can see the changes in the logos from simple pictorial form to the icons type. 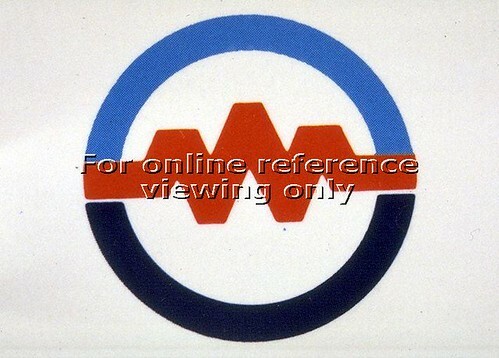 The blue and black semi-circle probably represents water and gas while the red “resistor like” represents electricity – I think so hehe. So what comes before the PUB? 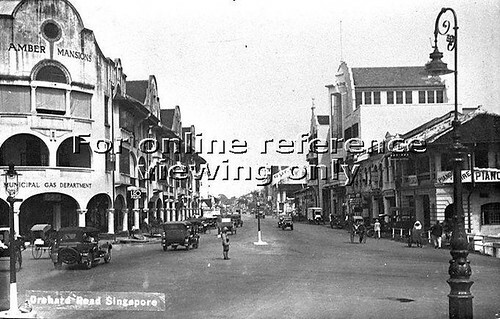 Soon after the founding of Singapore by Raffles, municipal matters were under the jurisdiction of the magistrates and later a Municipal Committee was established in 1851. What are municipal matters then? The municipal matters include transportation and infrastructure needs. It was only in 1856 that a proper Municipal Council was set up. It looked after street lighting, water supply, and even maintenance of roads, in 1864 gas supply and 1906 electricity. The Municipal Health Department was opened in 1887 and the Municipality also controlled public transport provided by the Jinrikishas. As a British colony, Singapore was conferred city status by a royal charter from King George VI IN 1951. The original Municipal Council was therefore renamed as City Council. It was only in 1965, upon Singapore’s secession from Malaysia, the City Council was abolished. In 1901, the Municipal Commissioners took over the operation and rapidly extended the gas supply network. By 1940, gas was used more for cooking and water heating than for lighting. Of course by 1963, PUB took over the gas department as well. 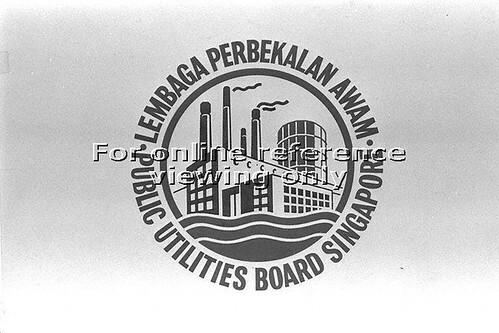 As Singapore is very good in making simple things complicated hehe, the Electrictiy and Gas Departments of the Public Utilities Board were corporatised to form the Singapore Power in 1995. Singapore Power (新加坡能源有限公司) is the only electricity company in Singapore, and is also one of the largest corporations in Singapore. 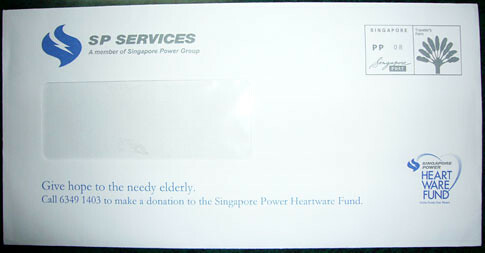 SP Services is a subsidiary of the Singapore Power Group. SP Services provides billing and payment collection on behalf of other utilities service providers such as the Public Utilities Board, City Gas and refuse collectin companies. City Gas was formed as a divested entity from PowerGas Ltd on 2 January 2002. Today, as a fully owned subsidiary of CitySpring Infrastructure Management Pte Ltd, its core business is to produce and retail town gas to all domestic, commercial and industrial customers. PUB now concentrates on Water business haha. 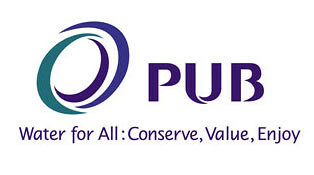 As the national water agency, PUB is responsible for the collection, production, distribution and reclamation of water in Singapore.